I have been looking forward to today’s walk. The only thing going against me is the rain. I don’t know it yet, but as well as the longest day of my walk it is also going to be the wettest. To be fair it only rained once, but it kept coming down in bucketfuls for six hours. Today I will be covering the longest distance that I plan to complete in a single day, just a fraction fewer less than twenty-one miles. It is not, however, the distance that is the major attraction for me. The Thames now passes through what I consider to be its best setting, where the mighty river seems to me to be at the most balanced stage of its development. Everything seems to be in proportion and simply just “right”. The waters have widened to form an ideal relationship with bank-side trees and buildings. No more the narrow confines of the upper reaches, or the wide expanses of the lower river that make the far-bank trees, bushes and even buildings appear rather distant. The vast majority of the day will be spent still walking through natural meadows, before prepared and maintained paths become more frequent. Buildings too are situated in that “in-between” state. The loneliness of the isolated farms that kept their distance from the upper river will be slowly disappearing as the habitation creeps steadily towards the river. Today the river will just tentatively venture into the outskirts of the city of Oxford and lightly kiss the edges of Abingdon. It is as if the river is playing out a courtship ritual with urban development before taking the plunge and becoming part of the “town set” in the stew pot of water, tarmac and brick that make up the lower sections. Immediately below Osney Bridge the Thames pathway passes the first industrial area it has encountered so far on the route. However, this is only a short walk and I am soon at the Grandpont Nature Reserve. This area has been carefully recovered from an old gasworks site and it is steadily reverting back to its natural state. The only evidence that can be seen of its former industrial occupation are the elegant white-painted “gasworks bridges” that cross the river. Nowadays they are apparently going nowhere, but in their working days they would have carried the numerous coal trucks that kept the city’s gasworks in full production. Folly Bridge looms up out of the miserable rain. There has been a crossing here since time immemorial, and it is probably this point that was the original ox ford that later gave the city its name. The first bridge dated from Saxon times and was constructed from timber. It was replaced with a stone built bridge by the early Normans around 1085, when it became known as South Bridge or Grand Pont. During the 13th century a nearby house was occupied by the Franciscan Friar, Roger Bacon, who was an early alchemist and astronomer at the University. 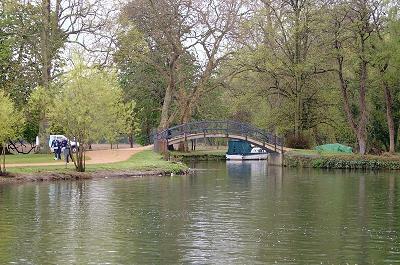 Bacon was believed to have been the cause of the bridge at one time being named Friars Bridge, a name it kept until the end of the English Civil War. After the Civil War the building was taken over by a Mr Welcome, who added an extra storey. This resulted in the building having a pronounced top-heavy appearance, making it seem to everyone who looked at it that it was about to topple over. Some local wag then christened it “Welcome’s Folly” and from that point in time it became generally known as Folly Bridge. The original building was demolished in 1779 but the name has stuck firm ever since. Many people imagine that the name “Folly Bridge” arises from a neighbouring house known as Caudwell’s Castle. 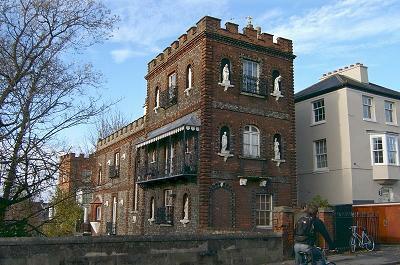 This unique building has an unusual castellated façade, with cast iron balconies and further embellished with statues fixed on the walls. However, my research revealed that this structure was not even in existence until 1849, so we must go back to Mr Welcome as being primarily responsible for the name. Shortly afterwards I pass Grandpont House. It was originally built for the town clerk, Sir William Elias Taunton, but it is a later resident that with a little imagination is potentially of much more interest. In the mid 1800’s Grandpont House was occupied by Alderman Thomas Randall. Now Alderman Randall was not a popular man. He was a local magistrate and seemed to have spent a great deal of his time leading a campaign to restrict public house opening times. Quite understandably this did not endear him with many of the students in Oxford. Alderman Randall had made his wealth as a hatter (you may see where this tale is going now). Who do we know who liked to have a few snifters around the city hostelries during the mid 1800’s.? Yes indeed, Mr Charles Ludwig Dodgson. It would be jolly good fun if he had immortalised the Alderman as his “Mad Hatter” in such a satirical fashion. Thus cheered I stride through the raindrops, passing the mouth of the River Cherwell emptying its waters into the main river and making its contribution to the wider stretches of the river that lay ahead.